Luggie Portable Mobility Scooter - Last Ideal world TV show of the year! You might not want to believe it but the New Year is almost here already! 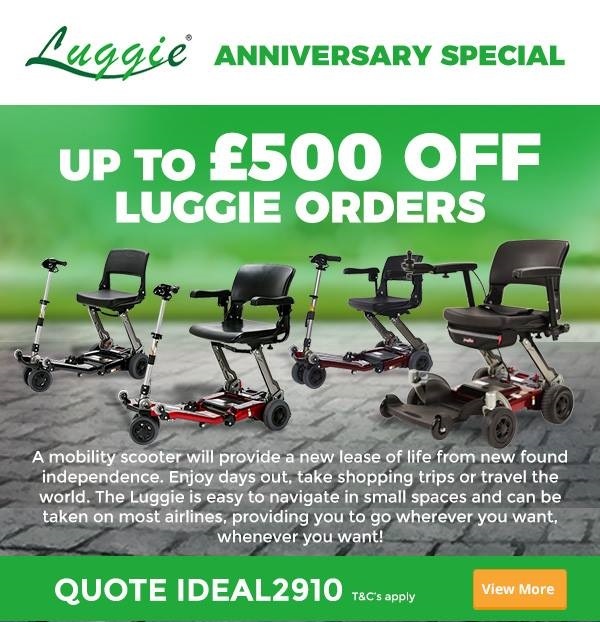 Here at Luggie, we can't wait to enter our 10th year since launching the Luggie Portable Mobility Scooter in 2009 and continue our unrivalled service in our anniversary year. But before all that, Luggie has its last Ideal world TV show of the year on 21 and 27 November. So why not tune in if you're thinking about ordering a Luggie mobility scooter, just in time for Christmas? "I bought the Luggie Super Scooter for cruise holidays more than anything else. It has given freedom to not only me but also my husband. We are able to do more, it is wonderful! It is a brilliant product with great customer service." - Judi Strain. "What an incredible mobility scooter the Luggie is. This wonderful machine has allowed my husband and I to travel to many countries in the last two and a half years. Thank you for giving him his freedom and independence back." - Nicola Martindale. "My Luggie, named 'Luigi', has been to Mexico, Sydney & Brisbane on the Rugby tour last year. I went up to the Sky Deck, up 66 floors in Eureka Tower in Melbourne. My Luggie has really made a huge difference in my life. I'm independent and am still able to travel with our friends." - Heather. Last Ideal world TV show of the year! We hope that you're able to take the time to view the Luggie Portable Mobility Scooter on its last showing of the year. But don't worry if you're not able to catch it! We offer home visits which allow you to spend some one on one time with our expert demonstrators and they can talk you through our scooters. There is no obligation for you to sign up for a Luggie until you are 100% sure that it's right for you!